Starring: Matthew Fox, Tommy Lee Jones, Eriko Hatsune, Colin Moy. It only takes one soldier to derail a mission. A good general can devise a shrewd plan of attack, assemble all the proper hardware and battlements, and command a robust group of soldiers to execute his orders. If, however, one lone soldier steps out of line, the entire mission can fly off the rails. Director Peter Webber (The Girl with the Pearl Earring) does an admirable job leading Emperor into creating a sumptuous portrait of history. The film, shot by DP Stuart Dryburgh, offers gorgeous painterly shots of Japanese locations and re-created post-war carnage. Emperor is a classically crafted film that could easily have provided a timely allegory for Bush-era American politics, but the vitality of the film is all but drained by one renegade party. The greatness of Emperor, despite its battalion of talent, is, as the army might say, completely FUBAR thanks to its wayward soldier, Matthew Fox. Fox, still looking sickly gaunt from Alex Cross, is insufferably dull in the lead role of what could have been a strong film. (To his fairness, though, he’s much better here than he was in the aforementioned Tyler Perry movie.) As his character, General Bonner Fellers, navigates the mess of post-war Japan, Fox advances the procedural with a series of wooden conversations played with monotone flatness. Some of Fellers’ explorations of the ideological turmoil in which Japan finds itself are intriguing, but watching Emperor was like Hiroshima on my brain cells as Fox mused dogma in bland, one-note voiceover for the better part of two hours. Fellers is tasked to investigate the culpability of Japan’s Emperor Hirohito and to provide evidence whether the Emperor should be tried for war crimes. The mission falls on Feller from General Douglas McArthur, who must deliver a verdict on the Emperor’s fate since he is technically the new ruler of Japan as the Supreme Commander of the Occupying Forces. 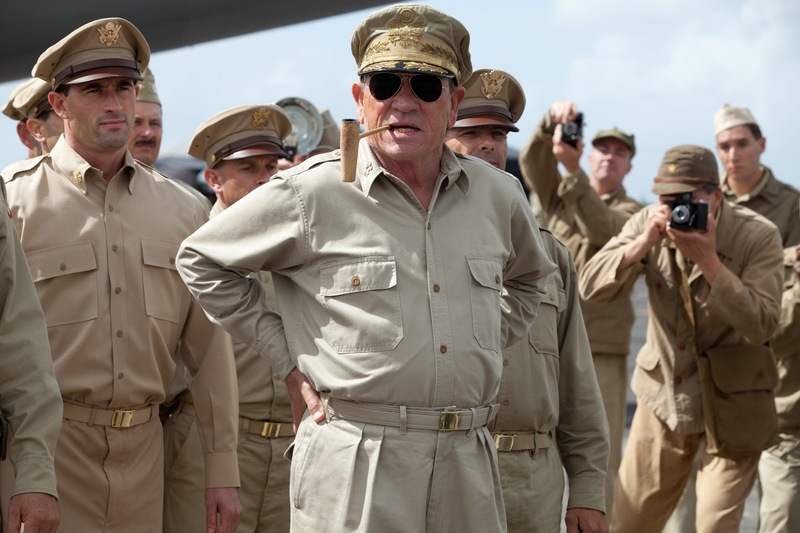 Tommy Lee Jones plays McArthur with marvellous gusto. The General is relegated to a supporting role in the film, yet Jones’s appropriately larger-than-life portrayal of the man brings the kind of fireworks one hopes to see in a film like Emperor. Jones is at his ornery best as he chews McArthur’s corncob pipe, so one can’t help but wish that Emperor focused more on the burden resting on the General’s soldiers, rather than on Fellers’ love life. Fellers—and, by consequence, Emperor—devotes much of its attention to investigating an old flame from the young man’s past. Before the war, back in America, Feller fell in love with a Japanese exchange student named Aya (Eriko Hatsune). Memories of Aya haunt Feller as he travels war-ravaged Japan, and Emperor provides ample flashbacks that show Feller following his girl to Japan, where the impending war cut their romance short. It’s not exactly as cinematic a musing as “We’ll always have Paris,” but the flashback scenes, dull as they are, help Fellers see the situation with utter clarity. Emperor delivers a verdict on the ideological dissimilarities that divide the East and the West—political and philosophical viewpoints are fundamentally different between ancient and comparatively new cultures. There is an ideology or a mindset that can’t be blasted out by force. Even though Feller and McArthur’s mission portrays the Japanese as a conquered people, the support for the Emperor suggests that the Japanese won the war… or at least until America got its way. Emperor comes to life in its final moments when General McArthur finally has a one-to-one session with Hirohito himself (played by Takatarô Kataoka). The Japanese, as McArthur states, consider Hirohito a god, so the man-to-man chat is a humbling endeavour to bring together the best of both worlds. The humorous meeting between the two suggests that these seemingly opposite ideologies are actually compatible if negotiated through civility rather than imposed by force. The post-scripts of the film, however, somewhat sugarcoat Hirohito’s renunciation of his divine status as a triumph for Uncle Sam. The preceding lesson could have offered an appropriate endnote to leave viewers thinking about the necessity of entering a foreign land and imposing democracy by force. Alternatively, the film could have provided more backstory on the cultural history of Japan, rather than the courtship of Fellers and Aya, to make the crumbling of the empire more palatable. Emperor ultimately results in the same kind of “Yay, America!” backslapping that some critics/filmgoers found problematic in Argo, but the delivery is nowhere near as engaging or, because of Matthew Fox, not nearly as entertaining. Emperor is currently playing in Toronto at the Varsity. Its Ottawa release is to be announced.